Brice (shoulder), Hyde (shoulder), Taylor (knee) all ruled out by #Packers . 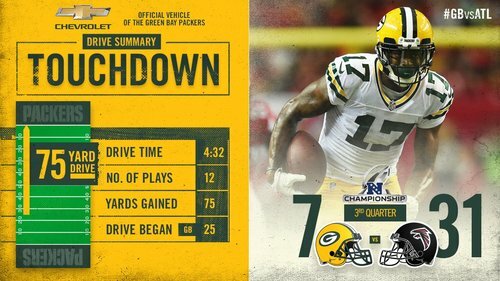 Of all the things today, the #Packers offensive line struggling was about the last thing I expected. #Packers go three and out to start the second half. Jared Cook with two drops. Yikes. Three-and-out to start the second half, including a pair of drops by last week's hero, Jared Cook. Oy. Falcons might get the over all by themselves. And just like that, the Falcons score. Julio Jones beat Gunter off the line of scrimmage and Damarious Randall cannot tackle anyone. Wowwww. #JetJones ✈️ has taken off! And there's Ty Montgomery's third carry of the day. Been a while since #Packers ran it. Ty Montgomery is being taken to the locker room. Packers are already missing three key players. #Packers RB Ty Montgomery walked to the locker room. #Packers RB Ty Montgomery, who is in the locker room, is questionable to return because of a injury. Ty Montgomery (rib injury) is questionable to return. #Packers RB Ty Montgomery has a rib injury and his return is questionable. Just went to the locker room. RB Ty Montgomery (ribs) is questionable to return for #Packers . Pretty sure Frank Reich is not walking out of that tunnel. But the #Packers just scored a touchdown. Rodgers finds Adams for a 2-yard score. #Packers are on the board with 9:19 remaining in the third quarter. 75-yard drive ended with a 2-yard pass to Adams. And so the comeback begins. The #Packers are on the board. Great camera work by @NFLonFOX to catch Jordy Nelson wincing and reaching for his ribs. Not such a great image for #Packers fans. #Packers a stop, touchdown and another stop from making this game interesting. That's a long way. Rodgers connects with Adams for the #Packers ' first points of the day. Going through Odell Beckham Jr., Dez Bryant, then Julio Jones is impossible. #Packers CB LaDarius Gunter is finding that out.